On this day (June 30) 50 years ago. My favorite football team was created. Who knew that 50 years since it was birthed, we would still be waiting for that first ring. Professional football first came to Atlanta in 1962, when the American Football League staged two preseason contests, with one featuring the Denver Broncos vs. the Houston Oilers and the second pitting the Dallas Texans against the Oakland Raiders. Two years later, the AFL held another exhibition, this time with the New York Jets taking on the San Diego Chargers. With everyone running in different directions, some local businessmen worked out a deal and were awarded an AFL franchise on June 7, 1965, contingent upon acquiring exclusive stadium rights from city officials. NFL Commissioner Pete Rozelle, who had been moving slowly in Atlanta matters, was spurred by the AFL interest and headed on the next plane down to Atlanta to block the rival league's claim on the city of Atlanta. He forced the city to make a choice between the two leagues. By June 30, the city picked Rankin Smith and the NFL. The Atlanta Falcons franchise began on June 30, 1965 when NFL Commissioner Pete Rozelle granted ownership to 41 year-old Rankin Smith Sr.. Smith an Executive Vice President of Life Insurance Company of Georgia at the time, paid $8.5 million the highest price in NFL history at the time 1965 for an NFL franchise. Former commissioner Pete Rozelle and Smith made the deal in about five minutes and the Atlanta Falcons brought the largest and most popular sport to the city of Atlanta. 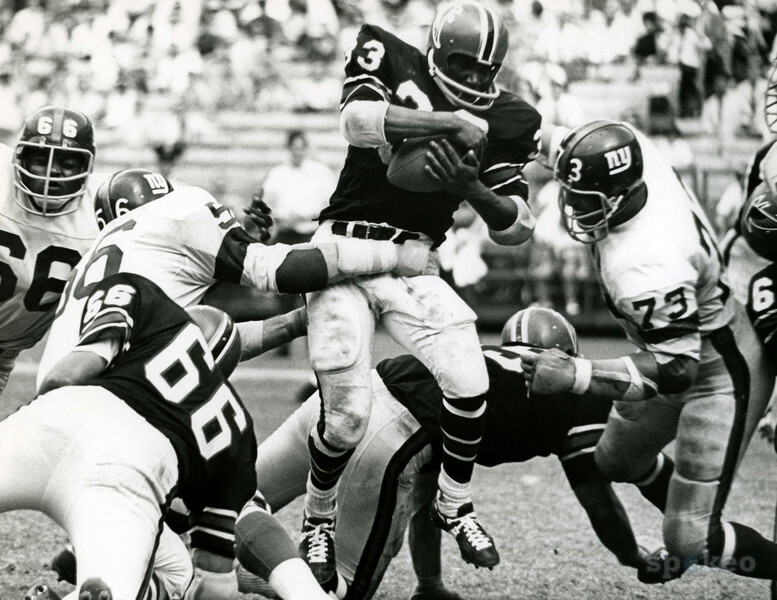 The Atlanta expansion franchise became the 15th NFL franchise, and they were awarded the first pick in the 1966 NFL Draft as well as the final pick in each of the first five rounds. 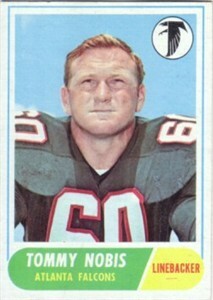 The Falcons drafted All-American Linebacker Tommy Nobis from the University of Texas with the first pick of the draft, making him the first-ever Falcon. The Atlanta Falcons Football Club received its nickname on August 29, 1965. Miss Julia Elliott, a school teacher from Griffin, Georgia was singled out from many people who suggested "Falcons" as the Nickname for the new Georgia NFL franchise. She wrote: "the Falcon is proud and dignified, with great courage and fight. It never drops its prey. It is deadly and has a great sporting tradition." Atlanta exploded out of the gate, going a franchise best 8–0 and remaining the last unbeaten team in the NFL that year. Their hopes to get an undefeated season came to an end with a 27–31 loss to the New Orleans Saints. Julio Jones had a remarkable second year, grabbing ten touchdowns and 1,198 yards. The Falcons finished the season 13–3, and clinched the number one seed in the NFC playoffs. The Falcons played the Seattle Seahawks in their first playoff game. Although they went down 28–27 with only 31 seconds left on the clock, Matt Ryan led the team to their first playoff victory, 30–28. It was the first playoff victory in the Mike Smith era. The Atlanta Falcons then advanced to face the San Francisco 49ers. The Falcons seized control of the game early with a Matt Bryant field goal, a trio of Matt Ryan touchdown passes caught by Julio Jones and Tony Gonzalez coupled with outstanding defensive play. By the end of the half, the score was 24–14.The tides of the game began to shift in the second half as the 49ers rallied back with a pair of Frank Gore touchdown runs. Atlanta's offense attempted to reply but were ultimately shut down by the 49er defense. A few series later, late in the 4th quarter with little time remaining, Atlanta found themselves in a 4th and 7 situation at the 10-yard line. The Falcons needed just 10 more yards to secure victory and advance to their first Super Bowl berth in nearly 15 years. Matt Ryan fired a pass to Roddy White which was ultimately broken up by inside linebacker NaVorro Bowman, resulting in a 28–24 defeat.